An assortment of confectionery specialties handmade from the finest Belgian chocolate, freshly roasted nuts & Australian glace apricots. The quality ingredients in this selection are entirely from non-animal sources. Note: 20% of the purchase price of all Vegan Samplers goes directly to People for the Ethical Treatment of Animals (PETA). If you would like more information about PETA please visit their web site at www.peta.org. 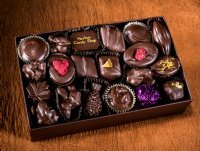 Vegan truffles (soy milk based) included in this assortment are best enjoyed within 2 weeks.